What OnePage CRM Triggers and Actions are Supported? New Pending Deal - Triggers when a new pending deal is created. New Won Deal - Triggers when a deal is won. New Next Action - Triggers when a new next action is set. Create Note - Adds a new Note for previously found contact, using Contact ID from Search Contact action. Create Contact - Creates a new contact in OnePageCRM. Find Contact - Find a contact in OnepageCRM. 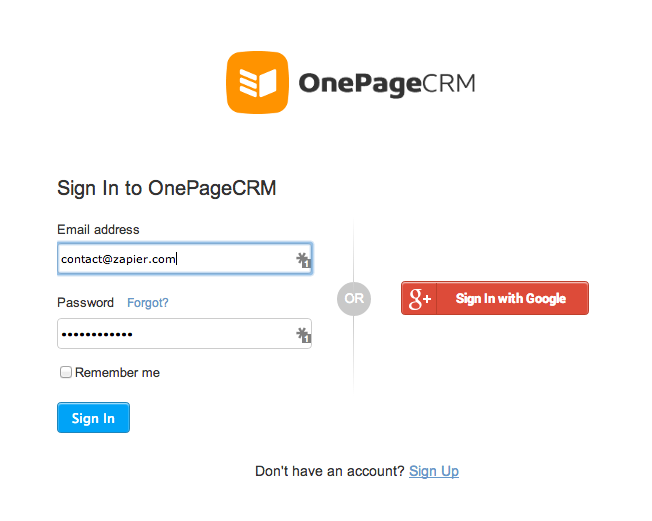 To get started with OnePage CRM, first click to add a OnePage CRM account in your Zap. Next, you'll name this OnePage CRM account. 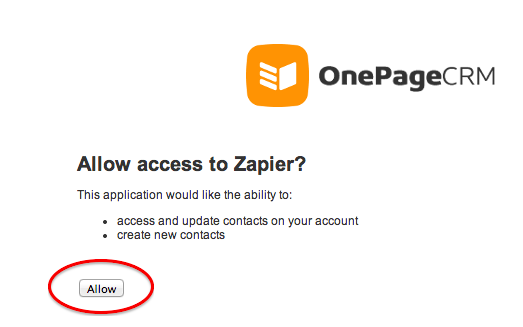 You should then get a pop-up window from OnePage CRM asking you to log-in to authorize the connection between that OnePage CRM account and Zapier. After logging in, you'll get sent back to your zap where you now have your OnePage CRM account connected!